Spring is in the air, which means it’s time to get signed up for Make-A-Wish Mid-Atlantic’s annual Walk For Wishes. Depending on where you live in the Mid-Atlantic Make-A-Wish area, there are four opportunities for you to take part in Walk For Wishes: Fairfax, Va., at the Mosaic District; Baltimore at the Baltimore Zoo; Washington, D.C. on the historic National Mall; and Annapolis at the Annapolis Towne Center. All proceeds from the walks will benefit Make-A-Wish Mid-Atlantic, so you can raise money to help grant the wish of a local child. Participating in a Walk For Wishes allows you to personally make a difference in your community. This year’s event at the Mosaic District is the first Walk For Wishes in Northern Virginia. It happens on March 26 from 6-8 p.m. The route covers 1 mile and registration costs $10. If you raise at least $100, you receive a commemorative Walk For Wishes t-shirt. Family activities will take place before and after the walk, and there will also be a closing ceremony with awards. Online registration has already started, or you can register the day of the event beginning at 5 p.m. In Washington, D.C., the 3-mile walk on the National Mall will be April 12. Registration for this event is free, and each participant that raises $100 or more will receive a commemorative t-shirt. The walk will take place starting at 2 p.m. with check in and day-of registration beginning at 1 p.m. Registration and all activities will be at Constitution Avenue NW and 17th Street NW near the Washington Monument. This is the fourth year of the Washington, D.C., Walk For Wishes, with the previous three having raised more than $400,000. Go to the event page for information on registration or other donation opportunities for the event. 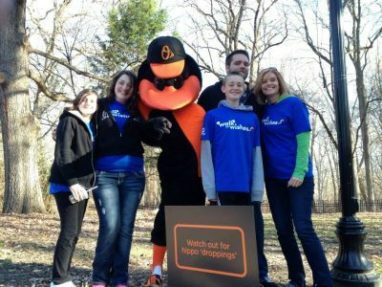 Registration for the April 19 Walk For Wishes at the Baltimore Zoo is $15 per participant, and includes an all-day pass to see the zoo after the walk concludes. Each participant that raises $100 or more will receive a commemorative t-shirt. Check in before the event starts at 7:30 a.m. The walk starts at 8:30 a.m. There are two routes to choose from – a 2.2-mile walk and a 1.1-mile walk. You can register online today, sponsor another walker or make a general donation to the event. In Annapolis on April 23, Walk For Wishes is an evening event with registration starting at 5 p.m. for the 6 p.m. walk. Registration is $10, and each participant that raises $100 or more will receive a commemorative t-shirt. Learn more about this Walk For Wishes at the event’s website. Walkers can register as teams, so if you have a group of family, friends or co-workers, you can form a team and start raising money today. The goal is to raise more than $480,000 at these events, which will be enough money to support more than 60 wishes!